Download the Doral Trolley app that provides real-time trolley information for your location or click on the real time link here. Do you want to know where the trolley is? Dial 305-593-6710, enter the STOP NUMBER located on the Trolley Stop Sign, and you will be informed approximately when the Doral Trolley will arrive at your stop. 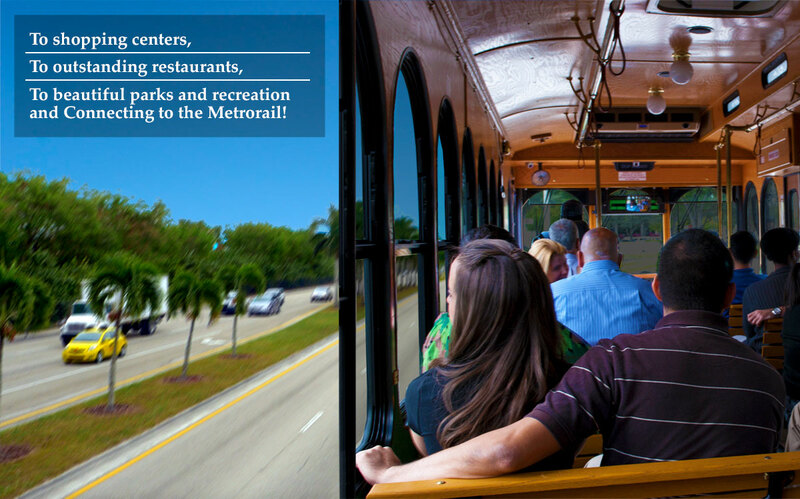 For Doral Trolley Trip Planning & Customer Service: 305-593-6740. Route 1 (Crosstown Connector): Provides service on weekdays Monday through Friday from 6:00am to 9:45pm. Saturdays from 7:00 AM to 7:24 PM, 30 minute wait times, and Sundays from 7:00 AM to 6:54 PM, 60 minute wait times. Route 2 (Commercial – Metrorail Connector):Provides service on weekdays from 6:00 AM to 7:52 PM (60 minute wait times), there’s no service on weekends. Route 3 (Residential – Metrorail Connector): Provides service on weekdays from 6:00 AM to 9:00 PM (30 minute wait times), Saturdays from 7:00 AM to 7:11 PM (60 minute wait times); there’s no service on Sundays. Your Doral Trolley Tracker provides real-time trolley information for all Routes. Unlike traditional trolley schedules, Doral Trolley Tracker lets you see and track the actual status of your trolley, so you know when your ride will arrive. Instead of waiting at the trolley stop, use Doral Trolley Tracker to help you plan your time – run another errand, finish up another project, or simply wait indoors. The Doral Trolley Tracker is also available through the City of Doral’s “Doral e-Gov” smart phone application. Additionally, the TSO Doral smart phone application is a good tool.